Many Seniors 65 and over are very independent and are living their lives with little to no assistance. As November is National Medicare Family Caregiver’s Month, we decided to write an article about what you and family can do now to ensure you maintain your best healthcare as you get older. The following is a quick list of questions that you should discuss with your family member is advance. Some of the questions should be part of a formal Living Will that you can develop with legal assistance. Who is the emergency contact? Which doctors are your currently working with? What drugs are you currently taking? Do you want to be resuscitated, etc? Many seniors don’t understand what is exactly covered under Medicare and don’t know the protocol to follow to to get reimbursed for expenses. Adria Gross, of Med Wise Billing, says that seniors and their families don’t understand that you need a 72 hour qualifying hospital stay to have Medicare cover their share of Skilled Nursing care. Gross stresses that patients should ask after a few hours at the hospital what there in or out-patient status is. Asking the right questions can save thousands of dollars, but if you are not familiar with how medicare works you will not be able to ask the right questions. 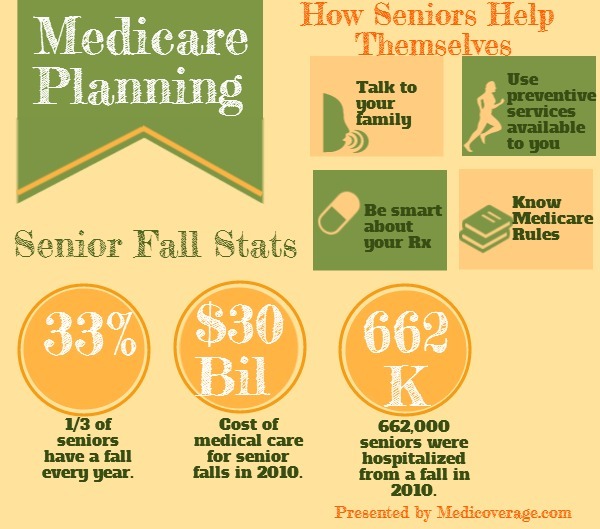 Senior healthcare is not just about worrying about the financial end of things, it’s also about making sure that you use all of Medicare’s or your Medicare Insurance’s preventive services. With many of the Medicare Supplemental plans (Medigap plans) and MA plans including gym memberships, seniors should utilize this benefit to improve balance and prevent disease. Also the ACA has included $0 charge for Medicare preventive care beneficiaries that include tobacco cessation counseling, vaccinations, and mammograms. Fukishama says that one of the main reasons seniors are at Long Term Care facilities is due to a fall, and many times it is because their vision had diminished. Get an annual vision checkup to make sure you peepers are in order. Family members often become the default caregivers when seniors become ill or injured. If you plan ahead and make smart decisions you can give them the tools to really assist you and maybe even postpone needing their help with some preventive planning.